Kathy started her lifelong interest in photography over fifty years ago with a Kodak Instamatic X-15, an inexpensive point and shoot film camera. Two more film cameras and three digital cameras have traveled with Kathy along her journey in life to where she is today. Her interest in photography melded perfectly with her love of nature. She is constantly in awe of God's natural beauty around her and feels privileged to not only witness that beauty but to also capture it in her images. Kathy has lived in five states and three different regions of the US. She is grateful for the abundance of beauty and inspiration that surrounds her where ever she lives. 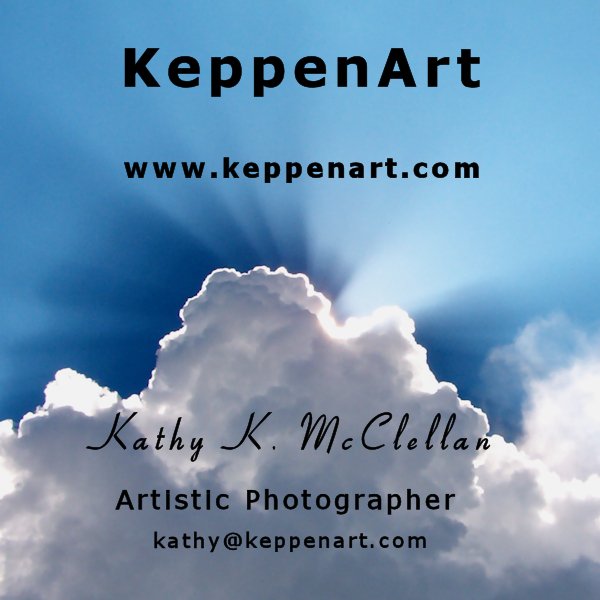 After following several successful career paths over the years, Kathy decided to concentrate on promoting the arts and offer her photography for sale to the public. She has started writing and painting again as she had done in her past. Modern technology is providing new opportunities and Kathy is excited to finally be able to share with others the beauty that she has witnessed and captured with her cameras. I have chosen photography as the preferred medium for my artwork because it is a very versatile medium that can be used as Fine Art, Photojournalism and Family Documentation. Nature has always been my main subject and inspiration but recently I have embraced the creativity of producing abstract images from my photographs and have started painting with acrylics. The future promises to be exciting and challenging with more choices in technology being introduced into the art world.